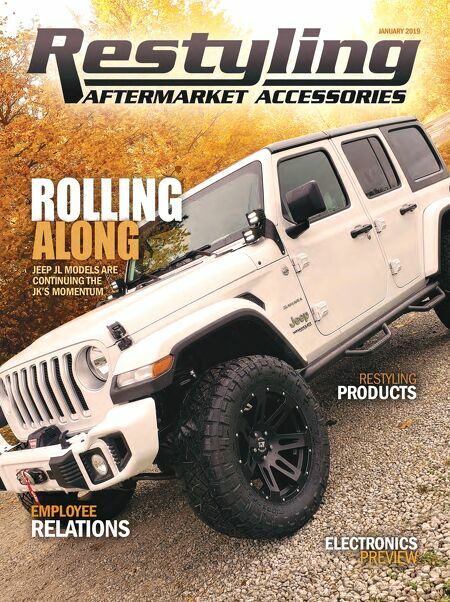 16 THE SHOP JANUARY 2019 Riding the Economic Boom he automotive aftermarket faces continued uncer- tainty in the new year as the United States pushes to rearrange its trade relationships with China and other foreign governments. The Trump Administration during the past year instituted a 25-percent tariff on foreign steel, and a 10-per- cent tariff on foreign aluminum, citing national security law; as well as duties ranging from 10 to 25 percent on $250 billion of imported Chinese products to combat intellectual property theft by Chinese companies. China retaliated with tariffs on $77 billion of U.S. goods imported into the country. Canada, the European Union, Mexico, India and Turkey also issued retal- iatory duties on U.S. products in response to the steel and aluminum tariffs. Russia and Japan are considering punitive tariffs on U.S. products as well, pending active trade negotiations with U.S. officials. The U.S. has provided tariff exemptions for steel imported from South Korea, Brazil, Argentina and Australia; while also exempting tariffs on aluminum imported from Argentina and Australia. The U.S. has been slower to grant tariff exemptions on Chinese imports. "I think that's an indicator that they don't intend to grant exclusion requests unless they absolutely have to," says Laura C. Farhang, a Washington, D.C.- based international trade attorney who served on a 2018 SEMA Show educa- tional panel discussing current U.S. trade policy. "There's a larger goal of breaking the supply chain for U.S. manufacturers relying on parts and components from China. I don't think they feel like that goal is going to be met by giving exclu- sions and making it easy." Meanwhile, President Donald Trump says it's "highly unlikely" the U.S. would delay a Chinese import duty increase planned for Jan. 1, 2019, when tariffs on $200 billion of goods are set to rise from 10 to 25 percent, according to a Nov. 27 report by The Wall Street Journal. News on the trade disputes with China and other countries is fluid. For instance, days after this article will be printed and distributed, Presi- dent Trump and Chinese President Xi Jinping are set to meet in Argentina. President Trump stated optimism the meeting could result in a new trade deal between the two countries, but also warned of additional tariffs if a deal isn't met. "If we don't make a deal, then I'm going to put the $267 billion additional on," Trump told The Wall Street Journal. The Trump administration—again citing national security law—is cur- rently weighing additional tariffs on imported vehicles and auto parts. Such a move could cause production in those industries to fall 1.5 percent and 195,000 U.S. workers to lose their jobs, according to the Peterson Institute for International Economics (PIIE), a nonpartisan and nonprofit thinktank. "If other countries retaliate in-kind with tariffs on the same products, pro- duction would fall 4 percent, 624,000 U.S. jobs would be lost, and 5 per- cent of the workforce in the auto and parts industries would be displaced," according to PIIE's analysis. Direct effects from the current trade disputes remain difficult to uncover. One positive result may be found in U.S. steel production, which has surged to its highest point since mid-2014. The production increase is forecasted to con- tinue into 2019, according to New York City data firm Trading Economics. In the automotive aftermarket, sup- pliers have been slow to increase prices on products sold to shops. Many manu- factured products and raw materials orig- inating from China and used in after- market accessories are already included in the Trump administration's tariffs. However, distributors industry-wide report having only a few conversations with suppliers mulling price increases. According to SEMA, however, the trade disputes are already hurting after- market accessory companies. "Our companies did not have this in their business plans," Stuart Gosswein, SEMA's senior director of federal gov- ernment affairs, told THE SHOP maga- zine. "They have to make decisions as to whether they're going to be able to absorb the tariffs or whether they pass them on to the consumers. The big question is 'how long is this going to last?' There is no answer to that." If the U.S.-China trade dispute con- tinues, aftermarket companies relying on Chinese manufacturing may face the prospect of rerouting their supply chains. "It took years to put these supply chains into place," Farhang notes. "On top of the actual nuts and bolts of moving the production line, you also have to find somebody who can manufacture to your exact specifications outside of China. These suppliers are expected to turn on a dime to make changes. There's a lot of frustration, a lot of anxiety and a lot of increased costs." 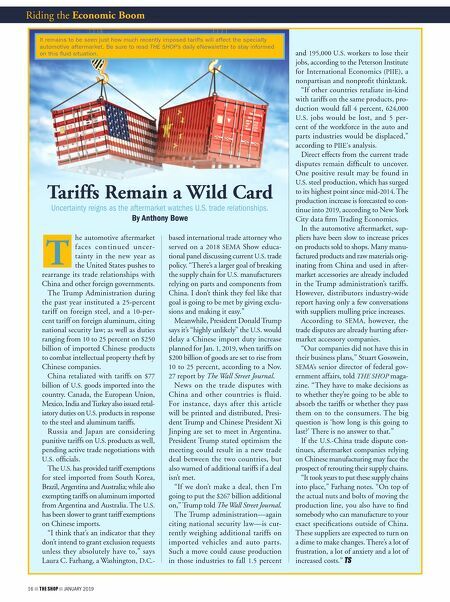 T Tariffs Remain a Wild Card Uncertainty reigns as the aftermarket watches U.S. trade relationships. By Anthony Bowe It remains to be seen just how much recently imposed tariffs will affect the specialty automotive aftermarket. Be sure to read THE SHOP's daily eNewsletter to stay informed on this fluid situation.